On Friday, Elon Musk posted an update on SpaceX's recent activities. There are lots of details there. One item that I don't think was reported so explicitly elsewhere is that as part of the station resupply demonstration contract, NASA has purchased an option on 3 demonstration flights for station recrewing. In other words, this is not merely a resupply demonstration contract with a vague plan for recrewing. Musk states that, if exercised, the option is of a similar value to the resupply demonstration agreement ($278 million). My math therefore puts the total value of the contract in the $500 - $600 million range. 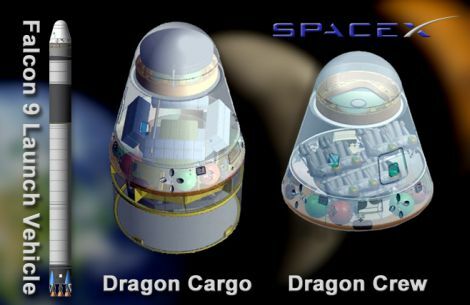 Reading between the lines, and given that the cargo and crewed versions of Dragon are very similar, it seems likely that SpaceX will invest its $200 million in the next several years for R&D in hopes of being paid back quickly by NASA once the agency exercises the recrewing demonstration option. Musk goes on to give a broad outline of his operational business plan with regard to NASA station resupply and recrewing. I'm uncertain about the precise price figures, in that he describes the resupply business as worth between $300 million and $500 million per annum from 2011 to 2015. Perhaps he means resupply and recrewing? With NASA estimated demand of about half a dozen flights per annum, the per flight price implied in a $300 - $500 million total seems a little high compared to SpaceX's published pricing of about $27 million per flight. One possibility is that he is charging a premium for the Dragon capsule, given that it's not a standard satellite payload. Another possibility is that he also is including services performed by other companies in the team. In any event, it might make sense to review what NASA said in its press conference to see of what that half dozen flights per annum demand consists.